Way back in 2008 I decided to take part in my first ever Triathlon. It was the London Triathlon, and I LOVED IT! In fact I loved it so much, that I figured if I joined the Army then maybe they would let me compete in Triathlon full time (turns out that didn’t happen), so I signed up to the British Army in 2010 with dreams of continuing my Triathlon adventures! The plan didn’t quite work out as expected, but I have completed many triathlons since, and still love the sport. So much so that on 7thJuly 2019 I will be completing my first ever FULL distance Ironman! But today I just want to take you through some baby steps if you are considering going for the half distance. (This was actually my most popular blog over on The Army Girl’s Guide so with a little bit of repurposing it’s here now!). 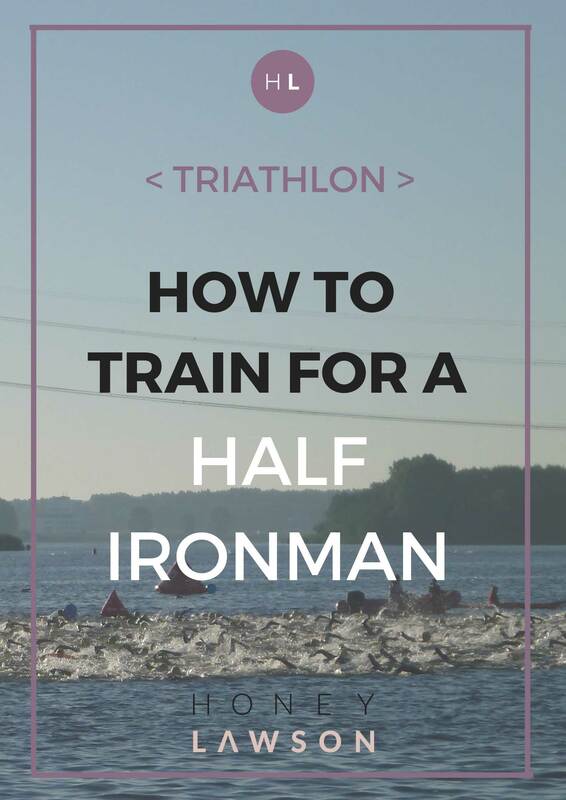 Are you wondering how to train for a Half Ironman Triathlon? Thinking it might be right up your street when it comes to endurance sports? There’s a reason people aren’t out doing Half Ironman Triathlons every weekend. This type of physical challenge is not only demanding on your body, but it’s demanding on your time, and your ability to stay focused and committed. I’ve now done 3 Half Ironman (Middle) Distance triathlons (1.9km swim, 90km cycle, 21km run),so am still very much a beginner, but I’ve learned some things after completing each one. Most recently my husband and I decided to enter Challenge Almere Amsterdam. It was a wonderfully organised event, and we got to enjoy Amsterdam for three days afterwards! That’s right. Don’t train alone and make it fun! I was fortunate enough to have my hubby train with me, which made the early starts and long rides more bearable (when I could keep up), and also held me accountable. 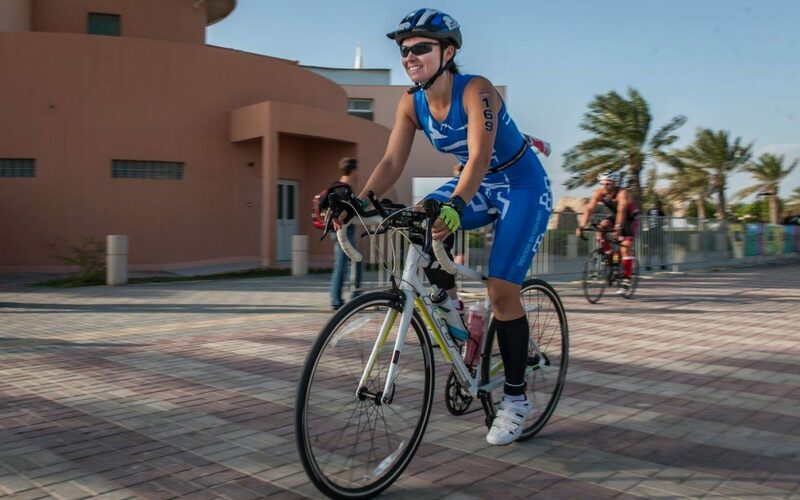 We also trained with the Bahrain Triathlon Club (BTC), which was another source of motivation, and taught us a few new cycle routes, as well as some handy tips and training techniques. If you can, get yourself into a club. Here is a list of some of the best clubs in the UK. There’s no need for brick sessions, but you might have to double up your training in a day. A lot of people stress the importance of going for a long run after a cycle, but after speaking with an experienced member of the BTC I was put off this idea. Yes, it is important for your legs to get used to running off the bike, but you don’t have to go 10km. It may actually be more beneficial to split the training, so you cycle in the morning, and run in the evening. Your body will be fresher, and you’ll get more out of the session, meaning your Half Ironman training will be more efficient and effective. So perhaps after a long ride go for a couple of kms of running, just to get the legs used to the transition, but don’t feel like you have to fit in your long run training at the same time. We decided to go to Amsterdam, which meant flying to the UK to collect my bike, then on to Amsterdam. Of course… a bike was lost en route (thanks British Airways… We got it back just before our flight to Amsterdam! ), and the stress of travelling with two bikes, along with all the other equipment, is just not fun if you are a beginner. Enter a race nearby, ideally drivable, and it will decrease your stress levels come race day! Want to find a race local to you? Try looking here. You don’t have to have trained the whole distance to go the whole distance. I’m not sure if you’re aware, but Bahrain is HOT in the summer. This made triathlon training particularly difficult. I decided not to spend hours on a treadmill, and wanted to train outside, but this meant early mornings, and some late nights (although it was still hot and humid in the evening). As a result of the heat, I didn’t do as much running as I would have hoped. In fact, the longest I ran was 12km. However, I had to have faith in the quality and intensity of training that I haddone. And training in the heat actually paid off. Come race day I felt great on the run, and ran my fastest Half Ironman triathlon half marathon segment in 1”54! Don’t leave your swim training to the last two weeks! In fact, most people are all too good at avoiding the discipline they like the least. For me, that’s the bike, so with gritted teeth I did as much cycling as I could fit in (around other commitments and some sneaky lie ins!). This made me feel much more confident on the day, and paid off as I was still feeling good when I got to the run. The husband, however, doesn’t like swimming, and we didn’t get in a pool until two weeks before the race! This is not the way to go if you want to feel confident in the water. You need to be organised with your training, and don’t leave any discipline to the last minute. So there you have it! 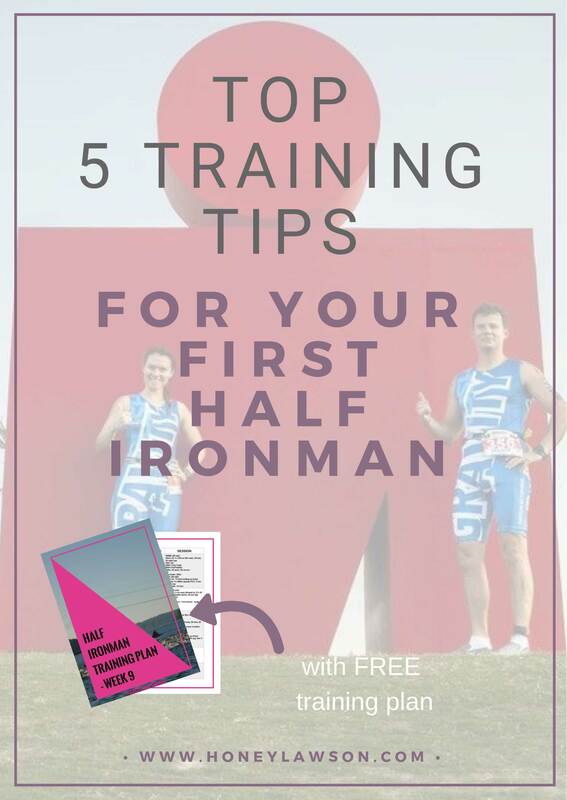 My top 5 tips to getting yourself to the start line of a Half Ironman Distance Triathlon and a FREE Half Ironman Week Training Plan. It goes without saying you need to train hard for a Half Ironman, and probably want to have a few shorter distance triathlons under your belt. If you have any tips you want to add, or have any questions on how to get started, then just leave a comment below. Update: Some people were asking for my finishing time after doing this training… I finished in a perfectly respectable 5 hours and 44minutes, 1 second. Remember, you can Click Here to get a FREE training plan example.